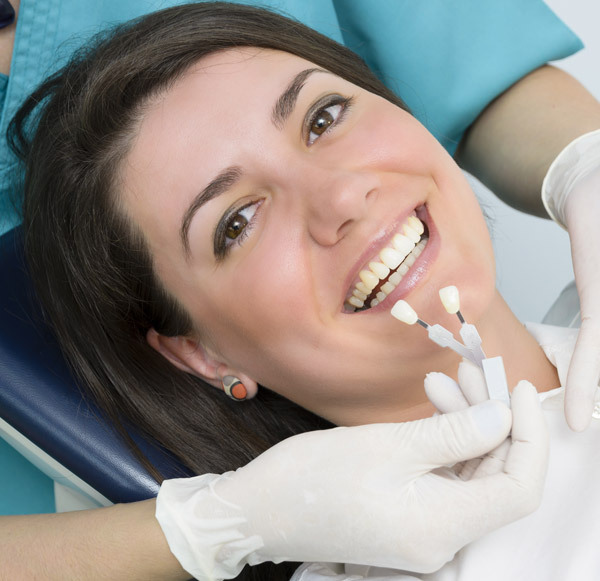 Kimbrough Dental Care offers a variety of cosmetic treatment options to improve on the look of your teeth, and to provide you with an effective solution to treat dingy, chipped, broken, misshaped, or missing teeth. If you are ready to improve the look of your smile and gain added confidence in your appearance, we have solutions to address the top concerns with your teeth. Schedule a consultation with us today to discuss how we can lighten, reshape, and repair your teeth. Teeth will naturally darken over time, and coffee, tea, tobacco, and some medications can speed up that process. If you’ve tried whitening them at home, you may be frustrated by over-the-counter tooth whitening products that do not perform as described. Dentist-supervised teeth whitening has been proven the safest and most effective way to eliminate stains and reveal your bright, youthful smile. Teeth whitening is something that sounds simple, and seemingly every toothpaste and mouth wash can “whiten” your teeth. We have tried many different whitening systems – from at home trays, to the in-office one-hour whitening, and even whitening strips – with inconsistent results from them all. We wanted to provide a system to our patients that would give them the results they wanted and deserved. That’s why we chose the KOR Whitening System. We started using the KOR Whitening System because it was first whitening system that understood the science of whitening teeth. 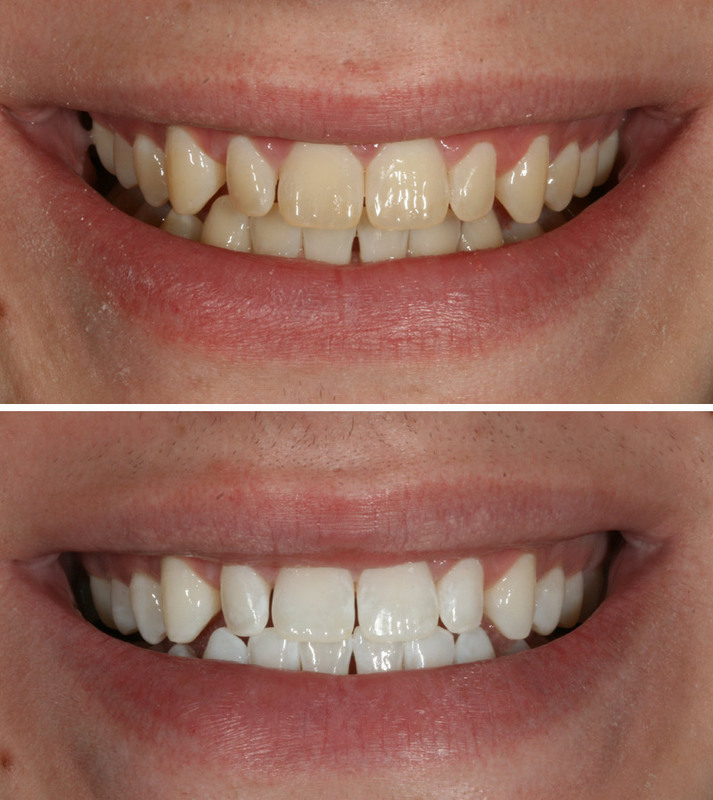 The system is based on precise fitting trays and highly active whitening gel. What makes it different is that the gel does not use chemical stabilizers. To whiten teeth the whitening gel must be reactive at room temperature. KOR gel is manufactured and shipped refrigerated to stabilize the gel. When the gel is placed in the trays and warms it becomes highly active! Because of this KOR can whiten stains that were previously thought to be difficult to impossible; for example, tetracycline staining! KOR Whitening results in lasting whitening of the teeth. With occasional touch ups (one night every few months or so), results are designed to be permanent. Before starting we recommend a cleaning and exam. We want your teeth to be as clean as possible, so that the trays fit like they should and you get best results possible. No whitening system can whiten crowns or fillings. Any system that makes this claim is only removing surface stain. If you have any fillings or crowns we can discuss what will need to be done after whitening to make them match. With every case, we take before and after pictures so that you can see your results when you’re finished! “Awesome customer service! Not a single person beginning to end that wasn’t professional and had great customer service!” Matt B. Are you unhappy with the appearance of your smile? Are any of your teeth misshapen, broken, cracked, or chipped? Are they stained, discolored, or darker than you’d like? Are there gaps between them, creating unattractive spaces? If the answer is “Yes” to any of these questions, then porcelain veneers may be the perfect solution for you. They are among the most beautiful, natural looking smile enhancement procedures available. Veneers are thin, custom-made shells of ceramic that attach directly to your teeth. They enable you to change the color, shape, and alignment of your teeth to match your lips and your face. They are a great way to improve your smile, and are a popular cosmetic procedure today. To prepare the teeth for veneers, we normally remove a small amount of enamel from the front and sides of the teeth. This makes room for the veneers so that your teeth look natural. We then make an impression, or mold, of the prepared teeth, and choose the veneer shade that will be the best match for your smile. After your veneers have been created from the molds, we then place the veneers on the teeth to check the fit and shape. 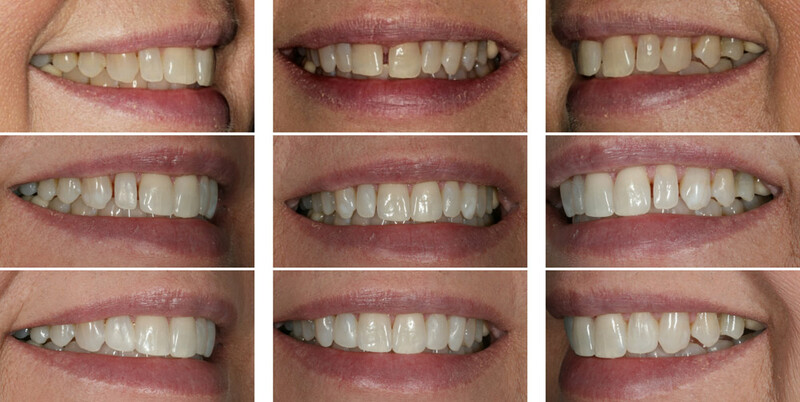 After any adjustments, the teeth are cleaned and the veneers are bonded to the tooth. When bonded to the teeth, your new porcelain veneers are nearly impossible to detect. They are also very resistant to coffee, tea, and even tobacco stains. Drs. Randy and Scott Kimbrough use the highest quality porcelains for veneers, and make sure they are bonded with the most advanced and proven materials available. The case above is a long time patient of the practice. While at work he broke his front tooth. We wanted to restore the tooth in the least invasive possible way. Instead of crowning the tooth, we decided to do a minimal prep partial veneer. 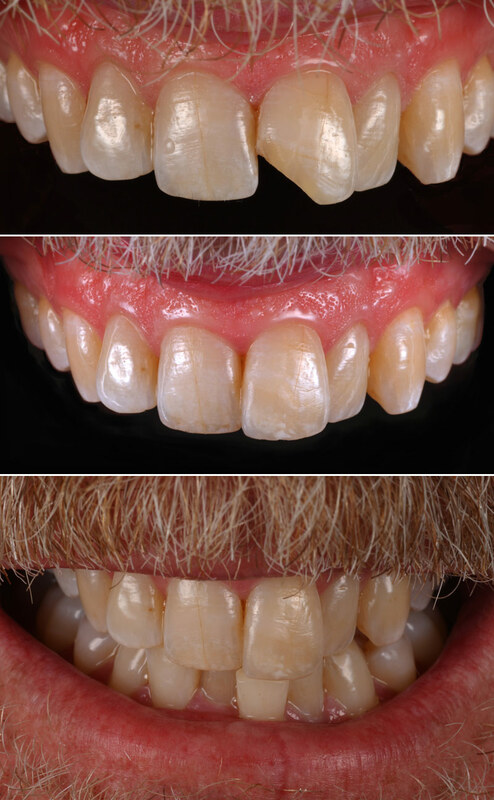 Matching any restoration to to the adjacent front tooth is one the most difficult esthetic challenges we face. By doing a partial porcelain veneer, very little additional tooth structure was removed, and the best possible esthetics were possible. “High quality service, professional and friendly. Great experience! The staff is friendly and attentive. I always hated dental work, but Dr Kimbrough is the best and makes it much easier. I would definitely recommend.” Ashley E.
Bonding is an alternative to Porcelain Veneers, but can achieve very similar results. 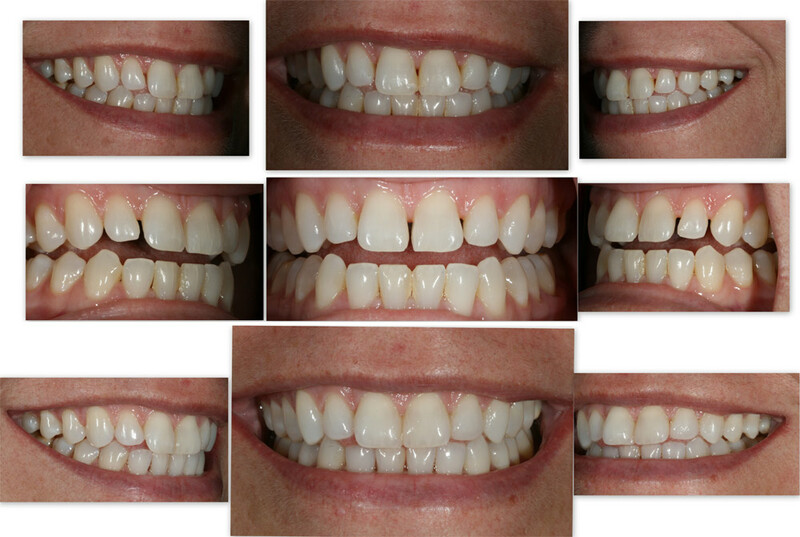 It is designed to improve the appearance of your smile by changing the color and shape of individual teeth. In dental bonding, a composite resin veneer is made from a tooth-colored filling material bonded to the tooth. While other types of veneer can require multiple visits to the dentist, composite bonding can often be completed in one visit. The tooth is prepared by lightly etching it, and then a bonding liquid is applied to the outer surface of the tooth. Once that liquid sets, a plastic resin is then applied to the tooth and shaped. After the resin sets, we then trim, smooth, and polish it, to make it look natural. Tooth Bonding is a popular treatment because it provides a successful attachment between the filling material and the tooth’s original enamel and dentin. It looks like the original tooth and functions like it as well. Tooth bonding or dental bonding is an excellent technique for small defects in teeth—chips, spots, gaps between the teeth. “Been your patients for nearly 30-years. Every visit is a pleasure, and the work is always trusted and outstanding! Sage advice and never with any pressure. You allow the patient to move at their own pace, and we’ve always appreciated that!” Maryleen C.